Learn how to identify your unique superpower, pursue your passion, and uncover your true genius work. I have been asked many times what my superpower is. Somehow this question continues to surface as a way to identify someone with a non-traditional, hip, fun label. I get it. You’re trying to move past the same old boring descriptions, share why someone is amazing, and be more creative. Kudos for the effort. But in all honesty, unless you’re hosting a superhero-themed event, I hate that question. The idea of a superpower trivializes the value that someone has worked their entire career to build by making the assumption its a gift or ability. It reduces a meaningful title or bio into a few words that aren’t very helpful. The question, “What is your superpower?” is also a pain to answer. I’m asked this question most often by those booking me to speak. This past fall, an event host once again asked for my superpower and once again I struggled to provide an answer that I could really stand behind because I didn’t really feel like I had a superpower. I needed an answer so I started brainstorming and made a list of everything other people have told me that I do well or excel at. I listed anything and everything that came to mind even if it didn’t seem relevant. The most interesting part of this exercise was how I reacted to the things I wrote down. In my reactions, I noticed a pattern. Every time I looked at something someone else said I was good at, my Impostor Syndrome reared its ugly head and presented a reason why it wasn’t a big deal and they shouldn’t be that impressed. ME: It’s no big deal. I have a system that helps me prepare in advance. ME: It’s not, I just created a system that takes care of everything for me. ME: We just set up system that makes getting out of the house fast and drama-free. ME: I’ve got a study system that reinforces the information so I don’t forget it. ME: I created a content system and applied it to all existing posts. I figured out that I downplay everything other people think I do well because none of it seems very hard — and none of it seems hard because I naturally see and create systems that make things in my life and my business run smoother, faster, and easier. I also realized that frustration I felt when working at the jobs I held before starting Bourn Creative came from inefficiency. My supervisors required me to do things the old way, the way things have always been done, or the hard way, and when I saw an easier or faster way, they weren’t open to hearing about it. I finally understood that systems rule my life. My superpower is taking something complex, messy, or hard to understand and turning it into something simple, clean, and easy to understand. It’s why I can listen to someone talk about their business for 30 minutes and immediately distill their message into one or two crystal clear sentences. It’s how I can look at a website or blog with several years of inconsistently managed content and completely reorganize it and clean it up in record time. It’s what makes taking a messy, disjointed, big idea and transforming it into a beautiful, cohesive business platform easy. It’s why in high school and college I studied by consuming information, creating study guides and worksheets, and reteaching the content to my friends — which is exactly what I am doing now with this website. It’s what I enjoy about design — it’s creating a visual system for information. Systems allow me to turn something complicated into something simple. And if something is simple it means doing the work is easier and faster, and eventually, it can be planned, scheduled, delegated, or automated. I use systems to manage my family and household, my kids have had systems to follow since they were toddlers, and my business thrives with strong systems to support the business, the people working in it, and the clients who hire us. Systems are how I get so much done with less stress, how I maintain a high level of profitability, and how I am able to enjoy so much freedom. Figuring out my superpower was eye-openeing but it doesn’t do much for me on its own. It’s not until I combine my superpower and my passion (work that I love) that I discover my genius work — the work you get lost in, excel at, and find fulfillment in. Genius Work: Teaching systems and strategies to freelancers and entrepreneurs so they can build successful, sustainable businesses while enjoying life along the way. Don’t have a superpower? 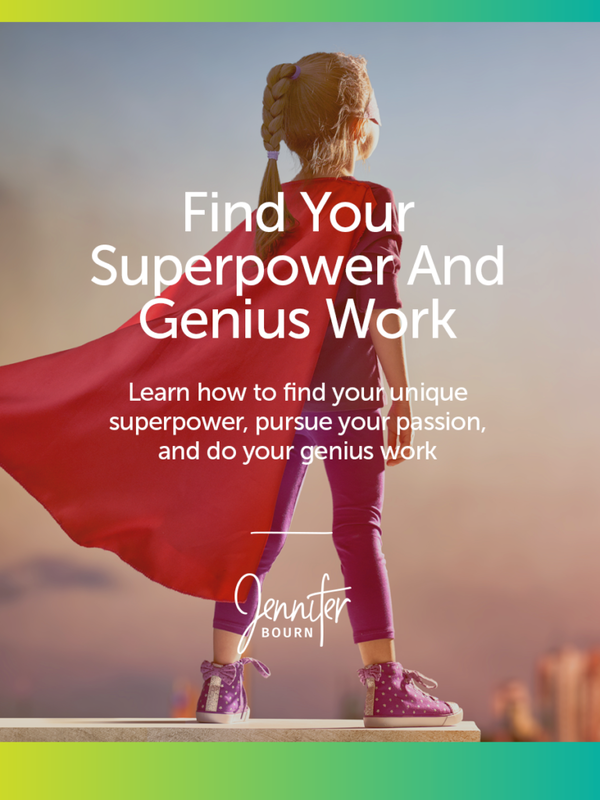 Download my Superpower Mini Workbook to find your own unique superpower and discover your genius work. If you have yet to find clarity around your superpower — that one thing that you’re incredible at, that comes easily and naturally to you, and doesn’t feel difficult, I want you to go through the same exercise I did. Make a list of everything anyone has said you do well personally or professionally or are good at. These may be things others have said you should offer as a service or turn into a course, or things they admire about you. Make a list of every project, task, or thing you have done that brought you joy, satisfaction, and fulfillment — list all the things you love doing. Note the skills needed for each item you listed. Review all of the skills listed and look for those that are similar or show up often. If one skill does not dramatically stand out from the others, evaluate the top three skills and ask which do you enjoy most, which comes easiest, and which hold the most value for you and for others. I think the reason it was so hard for me to find my superpower was that I was trying to think of one thing that I did extremely well, but that one thing never felt like a superpower. What I realized is that I wasn’t digging deep enough or looking at the things I do well holistically. For example: When looking at one task, like organizing blog content, it’s easy to see on the surface that I am good at architecting information. What I couldn’t see until I looked at a broad range of tasks, is that my superpower is what was underneath the surface skill. The reason I excel at architecting information is because I am wired to see and create systems. When you are working to uncover your superpower, don’t stop at the surface level skills used to complete a task you did well or found joy in. Dig deeper. Look underneath the surface to find the skill that made it easy for you to succeed and find joy in the work. Once you know what your superpower is, you need to figure out what to do with it. The true benefit of knowing your superpower is being able to use it to find your genius work, also called your genius zone. This is the work you’re most brilliant at and is often a core differentiator between you and your competitors. Your genius zone is where your passion and superpower meet. Write down the one thing you are most passionate about — the thing you would pursue if money were no object and no obstacles stood in your way. Pair your superpower and your passion and look at how they intersect. When you understand your unique talents — your superpower — you can use it to uncover the work you were meant to do, to find the work in your genius zone that brings you joy, happiness, and fulfillment. Plus, understanding your superpower and genius zone also enables you to narrow your focus, identify your ideal client, specialize in a niche, and create systems for your business. Plus when you are clear at what you are great at, you’ll produce better work and others will be clear about who to refer to you.